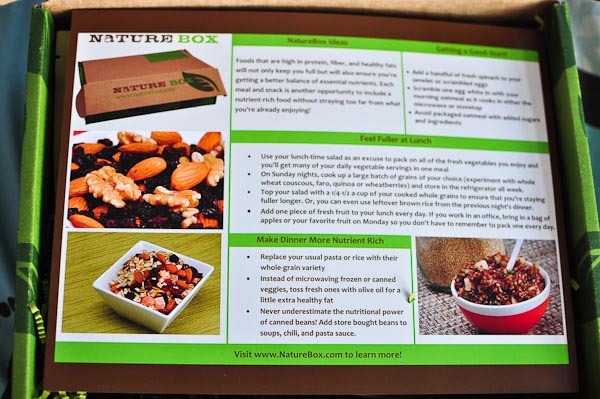 Today, I came home from class to something awesome in my mailbox: NatureBox is here! I’m pretty excited. Every time I get something in my mailbox that is not from my health insurance or junk mail, I get super excited. I’m like a little kid on Christmas. What, oh what could it be? I knew Naturebox delivers healthy snacks but there are just so many possible things that could be in there. The anticipation was killing me. Not really, but I was hungry and this was proving to be a perfect time to get some snacking done. The box and the inside is so pretty. The contents: Peppery Pistachios, Smokey Pumpkin Seeds, Dried Pears, Cranberry Jubilee, and Zingy Currants. How freaking awesome? One, I love dried fruit – especially when they are really just fruit. I’ve been craving pistachios for quite some time and I’m pretty excited to eat them up, along with the pumpkin seeds. The cranberry jubilee includes pumpkin seeds, cranberries, sunflower seeds, almonds, papaya, raisins, Brazil nuts, and apples. Sounds like an awesome trail mix to me. I have also never had dried currants and I can’t wait to taste those. Mmm, I love me some new healthy snacks. Who doesn’t, anyway? 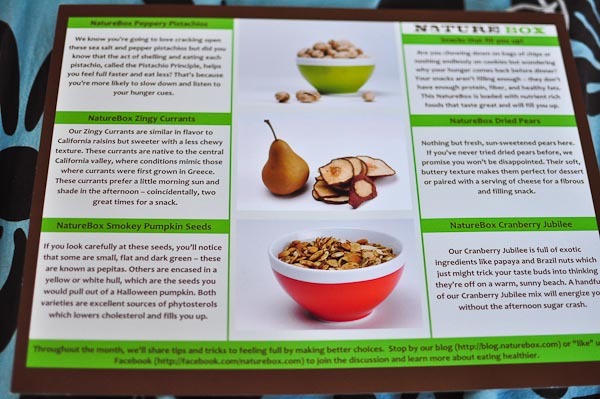 The boxes included a sheet with some healthy eating tips as well as a breakdown of all the snacks included in the package along with some info about them. 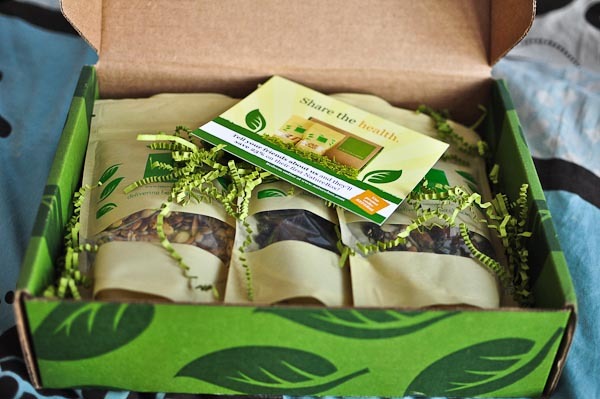 To give you some info about Naturebox, they are a subscription service which offers different healthy snacks on a monthly basis. What really got me pumped was the fact that all of the snacks are made with wholesome ingredients, are nutritionist-approved, and will never include nasty additives. The snacks have no high fructose corn syrup, no partially hydrogenated oils, no trans fats, no artificial sweeteners, flavors, or colors. 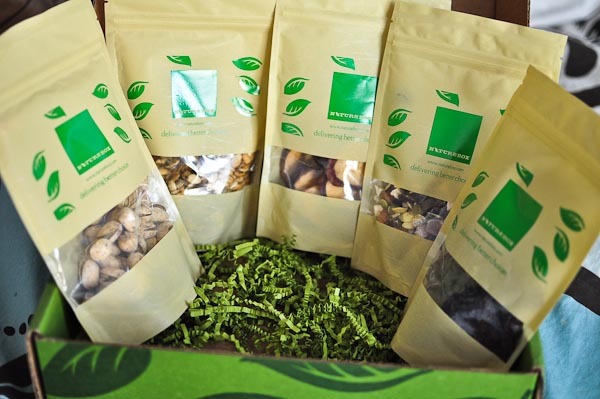 Their packages also can be fit to suit anyone needs including gluten-free, vegan, nut-free, or low-sugar products. Mine were just regular. I have no specific dietary needs except for just eating clean whole foods as much as I can. NatureBox is currently offering a 25% off discount for their first Naturebox. The code is REFER25. Regular price is $19.95 a month and includes 4-5 full sized snack packages in the box. Note: The box was shipped to me free of charge as a way to try the products out, since the company is new. The opinions are my own and I was not encouraged to write an overly positive review or any review actually. The package was given to me because of a Twitter contest I have participated in and they then contacted me about that. So yeah, if you are into getting healthy snacks delivered to your door every month, you could give this a try. Oh that looks great! Like you I love getting goodies in the mail! I’ll have to check Nature Box out! These look like an excellent, healthy snack! Thanks for sharing! !